From goodreads: When Lauren Monroe first laid eyes on Michael Delaney back in high school, she had every reason to stay away from him; within minutes of their first encounter, his volatile actions confirmed his notorious reputation. But Lauren saw something in him that caused her to question his bad-boy persona, and against her better judgment, she took a chance. She had no way of knowing that the unlikely friendship they formed would become so important to her. What can I say about this book that will do it justice? I absolutely fell head over heels for this story and I didn’t want it to end. I tried to read each page as slowly as I could but it didn’t work. I devoured this book like a piece of Cadbury chocolate!! This is romance at its finest!!! This is a story about second chances and forgiveness. 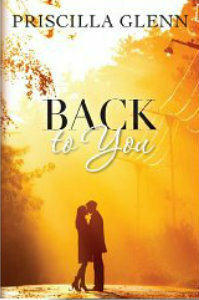 Back to You is told so beautifully that it made me believe again in the power of true love. It has instilled hope in the eyes of this jaded gal. I was wrapped-up in the story of Lauren and Michael from page one and nothing about their romance made me cringe or even skim a page or two. I read every blessed word and their angst quickly became mine. Michael is a broken man who hasn’t had a fair shake at life which makes him a little dark and edgy. He does things that make you want to slap him one moment and then hug him the next. Priscilla Glenn takes a very broken individual who has made mistakes and gives him so many redeeming qualities that you can’t help but fall in love with him. You love him for that man that he was despite some of his actions but you love him more for the man he becomes. And Lauren was so perfect but not the kind of perfect that makes you roll your eyes but instead makes you want to be her. She’s patient, kind and forgiving. Even though she was all those things, she was not afraid to speak her mind and that’s the best combination for a heroine to have. The story flows at the perfect pace and the flash-back sequences are woven with present day so gracefully that it’s not distracting one bit. There are moments that are so heart-breaking that I found myself holding my hand to my chest because that’s what this book will do, it will make you hold your chest so your heart doesn’t shatter. Yes, it’s that kind of story. The writing is flawless, the characters are filled with depth and you combine that with angst and love…all perfect ingredients for a beautiful book. This story spoke to me in a way that touched my heart. My final two cents: beautiful. Thanks Meg! I love to use vino and chocolate as my comparisons!!! LOL! Holy! I love your review! I heart this book so freaking much!!! Posted my review today and I feel like my words can’t even make the book justice. “Priscilla Glenn takes a very broken individual who has made mistakes and gives him so many redeeming qualities that you can’t help but fall in love with him.” – this was probably my favorite sentence from your review as it was exactly what I felt while reading it Thank you for sharing your thoughts! Have a great day!! Thank you so much!!! It’s truly a beautiful book! PS: I just tried to comment on your blog but didn’t see the option to do so. I loved your review as well! So not okay…I’m a believer in supporting other bloggers and their blogs! Did I miss the comment section?? Just let me know so I am aware for the future! *Sigh* I totally agree with every word of your review. I loved this book so much! Ahhhh!!! Thank you!! I love that book so much!